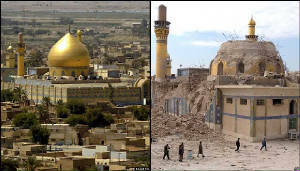 TEHRAN, July 20 (MNA) -- It should have been little more than an hour's drive south from Baghdad to Karbala. But it took an hour just to exit the checkpoints, with humvees intermittently veering into oncoming traffic. Along the road, a car lay smashed after colliding with a military vehicle. One complaint heard from Iraqis was that tanks accidentally drove over the top of cars, crushing passengers. Outside the city, progress was frustrated by a mile-long convoy of APCs, tanks, humvees, and military supplies waiting for deployment. Hundreds of civilian autos were forced off the four-lane highway onto a narrow dirt road bisected by railway tracks. Traffic stalled, zigzagged, and backtracked. Cars, trucks, and SUVs fought tanks to maneuver. More waiting. From the chaos and dust, a train sped by and sent vehicles squealing; then relief that the commotion wasn't a car bomb. The trip took four and a half hours. Camp Lima Forward Operating Base, just east of Karbala, is home to the 155th Armored Brigade BCT of the Mississippi National Guard. The Civil Affairs Battalion team headed by Chaplain Terry Partin, Major Jack Helmers, and Major Kenneth Booth voiced U.S. support for democracy, human rights, and "winning hearts and minds." The soldiers gave an example. After a night house raid, troops would return to the affected neighborhood in the morning and distribute toys. Major Booth then explained U.S. reconstruction plans and the unit's motto: S.W.E.A.T. Sewage, Water, Electricity, Academic, and Ttrash priorities. He said that their major obstacle was getting the money to rebuild. Despite this limitation, the military had begun five water and electrical projects, schools, and a nursing home. Major Booth felt it was now "up to the Iraqis" and that those who expected more were being unreasonable. "They think every problem is a U.S. problem. They can't expect us to turn Iraq into Switzerland in six months." Being in country for nine months, Major Jack Helmers was asked why the Americans invaded Iraq. 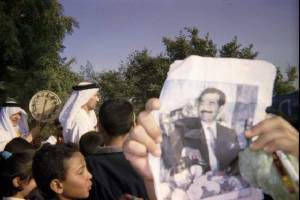 "There are many reasons," he said, "but mostly Saddam himself was a weapon of mass destruction. He killed Kurds and Shiites. He was working on other WMDs. We may still find them." He added that part of the 155th's mission was "explosive ordnance disposal." Experts claim one WMD, depleted uranium, is easy to find. But American authorities have refused to clean it up or acknowledge its harmful effects. Conventional weapons also posed a danger. In the past, live munitions were piled along streets unmarked, due to a shortage of yellow plastic 'caution' tape. Major Booth reassured us: "A lot of the explosives are fairly stable -- though some devices can explode with weather or temperature changes." Pedestrians casting a shadow over an undetonated object could also cause it to explode. On a visit later to the Karbala office of Iraqi Human Rights Watch, Hussein Al Abrahemy placed a cluster bomb on his desk. He claimed citizens had unsuccessfully requested many times that the U.S. military retrieve the WMDs. Daisy-cutters, in addition to cluster bombs, were still being found throughout the city. Children thought the yellow devices were toys. So on April 3, 2005, a committee headed by Ali Hamza of the Muslim Peacemakers Team finally decided to dispose of the ordnance themselves. 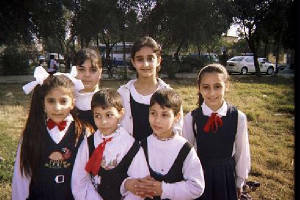 Attempting to clear a school yard of explosives, Hamza was killed. The Army promised compensation, but the family has received nothing. 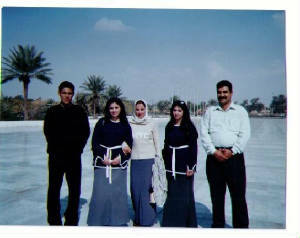 Responding to American inaction, the Community of Victims' Kin was founded, demanding that 5% of Iraq's oil revenue be allotted to war victims' families. The incident challenged Major Booth's earlier statements on democracy and Iraqi human rights. Ali Nassir of the Iraqi Council for Solidarity and Peace commented that democracy was a long term commitment. "If you want to build a house it may take a year, but to build human beings it takes the future. The U.S. Army didn't bring democracy." It may not have brought equality either. 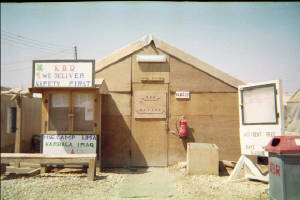 On the way out of Camp Lima Base were two latrines. One marked "IRAQIS ONLY" and the other "NO IRAQIS -- AMERICANS ONLY."